Niku Steakhouse is a boutique dining experience with high-touch service. 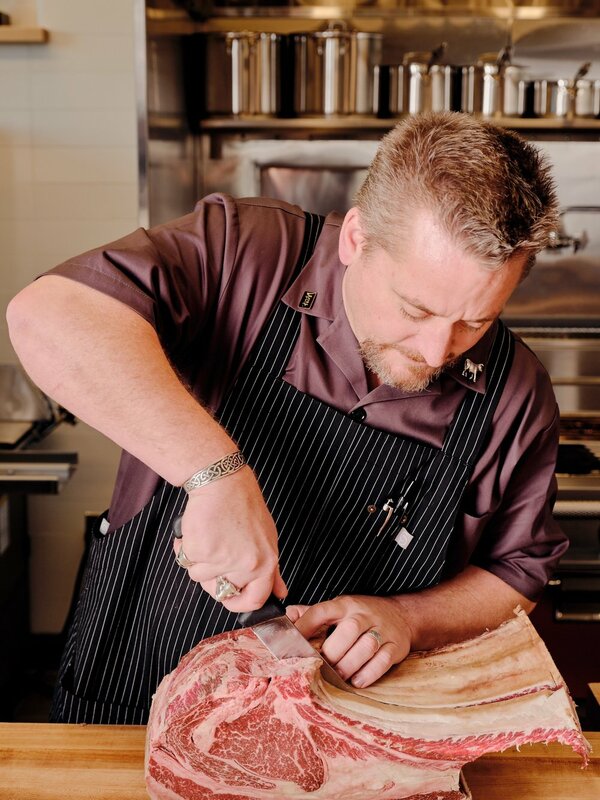 Led by Executive Chef Dustin Falcon and the team from Omakase Restaurant Group, Niku is among the few American steakhouses to have an in-house butcher, Guy Crims, who also oversees the nose-to-tail butcher program at The Butcher Shop by Niku. A dramatic kitchen with a binchotan charcoal grill, a wood-fired yakiniku grill and Kappo-style counter seating for 18 is the focal point of the dining room, with additional table seating for 30 guests. The room features a private dining space partially hidden by a floor-to-ceiling wall of wine. The steakhouse offers more than 100 California wines–all available by the glass–and a full bar with a focus on whiskey. Guy Crims, or “Guy the Butcher,” as he’s generally known, is a veteran of the butcher business and a legend in the world of Japanese Wagyu. In 2017 alone, Crims was responsible for bringing 4.3 metric tons of Wagyu beef into the U.S.
Crims, a California native, became fascinated with the butcher business when he was 14 after reading The Jungle, Upton Sinclair’s novel depicting the American meatpacking industry in early 20th century. His first job was at a family-owned butcher shop in Pacifica. Crims followed the original owner to a butchery in San Francisco, where he continued to hone his craft. In college, Crims studied architecture, not food—although the two passions merged when he worked on a slaughterhouse design project that advocated for the humane treatment of livestock. He continued to blend both roles as a managing partner at Pape Meat Company and most currently, as a managing partner of One Henry Adams, which includes Udon Time, Niku Steakhouse and The Butcher Shop by Niku. In 2017, Crims was invited to tour Japan with the Japanese Wagyu Beef Committee—the only non-chef included on the tour. There, Crims met Omakase Restaurant Group co-owner Jackson Yu and CosechaSD Chef Steve Brown. Chef Yu enthusiastically introduced Crims to his business partner Kash Feng, who was in the early planning stages of a Wagyu-focused butcher shop and restaurant concept slated for a space at One Henry Adams. As plans started to coalesce, Feng tapped Crims as the master butcher for both the restaurant and butcher shop concepts. As the master butcher for the neighboring Niku Steakhouse, Crims works to ensure quality and consistency for the restaurant’s meat program.